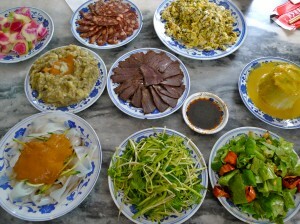 I’m currently in Shanghai, after the end of my first gastronomic tour with WildChina! I spent ten days or so introducing a small group (ten guests) to the amazing diversity of Chinese cuisines. 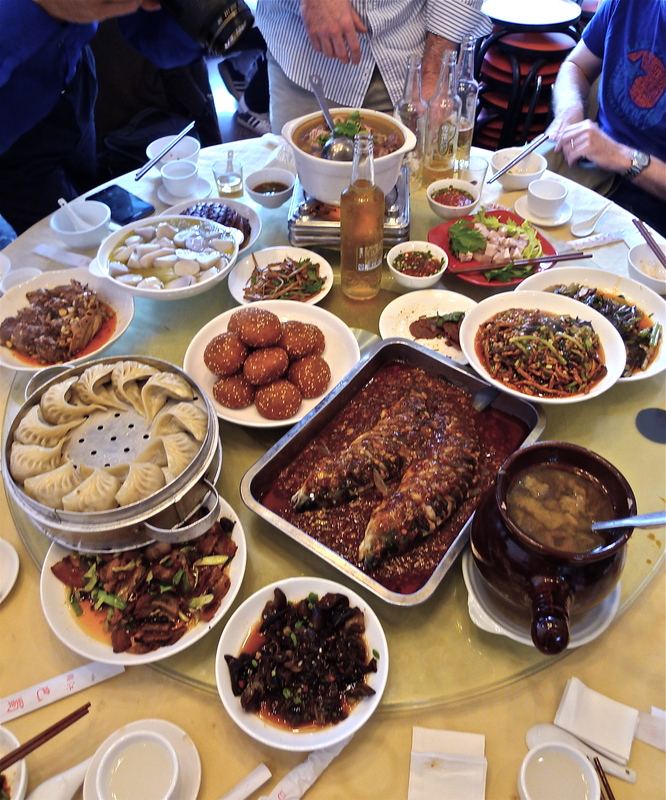 We began in Beijing, where we tried famous Shandong dishes, Beijing folk cookery, Mongolian hotpot and Peking duck, and then flew to Xi’an, where a trip to see the Terracotta Warriors was bookended by slap-up feasts of local specialties. 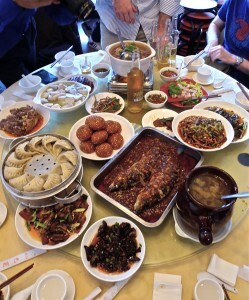 In Chengdu, we sampled xiao chi (‘small eats’), hotpot and many traditional dishes, enjoyed a glorious formal banquet and attended a hands-on cooking class; and in Shanghai and Hangzhou we scoffed fabulous dumplings and many local delicacies. 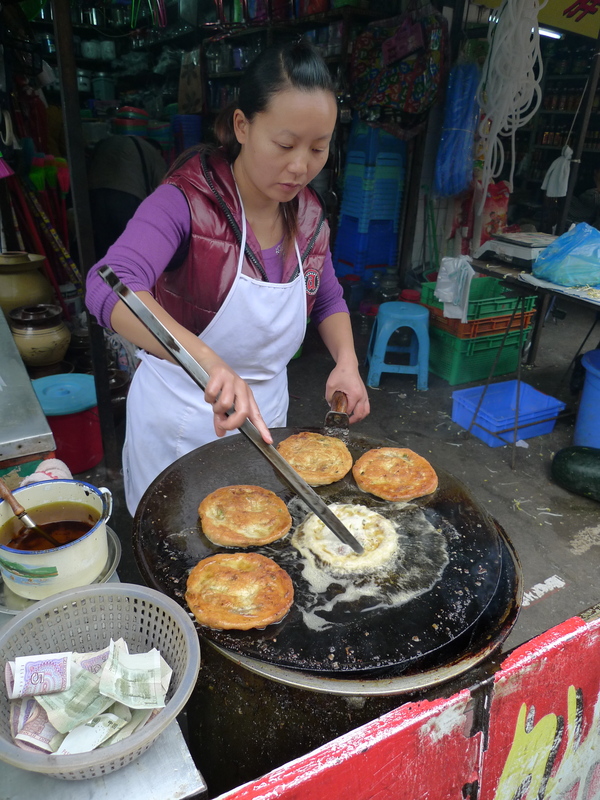 All in all, if you count street snacks, we tried over 300 dishes. By the end of the trip, I was exhausted, but exhilarated! Yesterday I checked out of my hotel and into a friend’s home, vowing to eat only salad for several days – but then another friend who is briefly in town insisted on going out to eat hairy crab! I have to admit that my appetite was a pale reflection of its usual self. Today, I’ve just lazed around in aspa, being covered in cucumber, steamed, scrubbed and massaged, and I’m finally feeling calm and rested. My job as tour leader has been to choose restaurants, arrange menus and talk about the food – and, more importantly, to try to ensure that everyone has a wonderful time. This, of course, involves gauging and accommodating the limits of people’s adventurousness when it comes to eating – and in this case, there weren’t any. Every single person said they were willing to try anything. So I was able to order exactly what I thought was most interesting and representative of each regional cuisine – even in a Sichuanese hotpot restaurant, where it is customary to eat a fair amount of offal and rubbery delicacies. The son of the owner joined us for dinner, and couldn’t believe it when he saw a bunch of Westerners tucking into tripe, goose intestines and rabbit’s kidneys. He told us we had totally changed his view of what was possible for foreigners dining out in China – which means, I hope, that he will extend his translated English menu to include not only the meatballs, sliced beef, mushrooms and vegetables, but also the offal and other stuff that an increasingly number of Westerners might be keen to try. Actually in several restaurants I had to argue vociferously with waiters who assured me that foreigners would not eat this or that, and urged me to order just sweet-and-sour fish and boneless stir-fries. When even someone who speaks Chinese and knows how to order has to battle to get beyond the traditionally acceptable stuff, you can see how tough it might be for an ordinary tourist, speaking no Mandarin but hoping to eat the most Chinese versions of Chinese food. Anyway, I hope we have beaten a track along which others will follow! By the way, if any of the tour group are reading this post – thanks you all again for being such fantastic travelling companions and enthusiastic eaters! P.S. After a couple of weeks of Gargantuan eating, and three weeks after I was last here in Shanghai, I arrived at my friend’s flat and one of the first things she said to me was: ‘Fuchsia, you’ve lost weight’. And the extraordinary thing is that I think she may be right. Which all goes to suggest that, however hard you try, it’s much more difficult to get fat on a Chinese diet than a Western one. Is it the lack of dairy products? The relative lack of sweet things? Less snacking between meals? That’s fascinating! When you were at Capital M I was going to ask how you maintain your figure. Right well I best get saving for next October then! The dish hovering on the corner of the stainless pan with the fish is, according to another site which posted a tempting close-up, fish fragrant eggplant. I am baffled by the ingredients Fuchsia. It appears so different from your recipe which, by the way, is a household hit. Can you elucidate? Is everyone in China these days? I emailed two friends on the weekend and one replied from Lijiang, the other from Kunming. It’s interesting how the Chinese make assumptions about what they think foreigners will eat. I remember how my parents would worry that visitors would dislike cooking smells such as dried mushrooms, and would always offer a ‘Westernised’ meal to our friends who came over to play. I guess British tastes in the 70s were more conservative, but I think that Chinese flavours are generally mild, and even the smell of stinky tofu pales in comparison to some French cheeses. Oh yes, do more of them! Thanks so much for a wonderful trip, Fuchsia. Looking forward to joining you on a future trip! Hi Fuchsia, thanks again for a great trip, it was a lot of fun! We are all 吃货，please let me know your next吃货 tour and i’d like to join you. Just found your website, was looking to get in touch to see if you did gastronomic tours… and then saw this! How does it work? How does one sign up? Have you thought of doing a gastronomic tour of London? Of Soho supermarkets? I saw you once at Bar Shu as I was looking at the cookbooks (which I have, so didn’t buy), didn’t realise it was you and am regretting the missed opportunity to talk to you. I love your stuff and would love to learn from you. Keep it up! Hi we are big fans and this looks amazing. Ive seen the dates of the next tour you are doing, any chance we could ask you a few questions about it before signing up? Feel free to email me through the contact page on this site! And Lyn – just come and say hello next time!